To ensure that all members of society have the opportunity to understand the role of science, biology, and technology as they relate to neuroscience and drug abuse and addiction research, the National Institute on Drug Abuse funded new grants through its Science Education Drug Abuse Partnership Award from 1992-2013. The purpose of the SEDAPA program was to fund the development and evaluation of innovative programs and materials for enhancing knowledge and understanding of neuroscience and the biology of drug abuse and addiction among K-12 students, the general public, health care practitioners, and other groups. NIDA funded programs that range from improving science and drug abuse knowledge among high school students in local community to the development of broad media outlets, such as radio stations and websites. A brief description of some of the projects that NIDA has funded is listed below. Goal: The Doubles, a seven-episode series of media tools was designed to teach third- and fourth-grade students about the science of drug addiction. The program's curriculum was delivered via either a set of DVDs, interactive CD-ROM, workbooks, or an Internet site to determine the most effective way of teaching about drug abuse. After completion of the grant, Dr. Epstein collaborated with educators to produce a comprehensive teacher's manual that describes how the multimedia programs can be used to extend and enhance standard curriculum instruction. The Doubles: The Doubles: A Case Study on Developing a Technology-Based Substance Abuse Education Curriculum. Epstein, J., et al., (2004) Evaluation Review, 28(6), 539-563. The Doubles: Evaluation of a Substance Abuse Education Curriculum for Elementary School Students, Epstein, J., et al., (2007) Child and Adolescent Substance Abuse, 16(4), 1-22. Goal: This grant evaluated the effectiveness of presenting educational materials via traditional instructional techniques versus embedding the curriculum into a narrative story line. Program staff worked closely with substance abuse researchers, curriculum development experts, and members of the clergy to produce scripts that are educationally sound, scientifically accurate, and suitable for presentation within a faith setting. Analysis indicated that children from both experimental groups demonstrated immediate gains, but those who viewed the didactic format retained their knowledge over an eight-month follow-up period. Churches throughout Missouri have enthusiastically implemented the program. In addition, Dr. Epstein has partnered with Committed Caring Faith Communities to facilitate dissemination. The group has been responsible for disseminating the program across the nation. Space Scouts: A Collaboration Between University Researchers and African American Churches, Epstein, J., et al., (2007) Journal of Ethnicity in Substance Abuse, 6(1), 31-43. A Longitudinal Comparison of Two Versions of an Interactive Multimedia Substance Abuse Education Program, Epstein, et al., (2009) Journal of Child and Adolescent Substance Abuse, (Vol. 18, Issue 3, PP. 302-321). Goal: This project sought to determine whether girls and boys respond differently to different formats in educational materials. A science of addiction education program was developed for fourth and fifth grade students using two different formats, a competitive video-game format and a socially collaborative format. The project tested the efficacy of these two formats with boys and girls and found that girls demonstrated significant learning with both formats whereas boys learned with the video-game format only. Goal: Kids Judge! Neuroscience Fairs (KJ! Fairs) were "reverse" science fairs where university faculty, postdocs, research staff, graduate and undergraduate students created neuroscience exhibits that were judged by elementary school children (grades 3-6). Each exhibit taught basic neuroscience concepts to the children in a fun 3D manner that allowed the children to explore and sometimes even climb on the exhibit. Goal: This multifaceted project sought to disseminate research based science information to a broad audience. The Brain Power program was delivered to schools in Washington and neighboring states where it reached over 30,000 students and 4,000 adults. The program consisted of 12 lessons and a materials kit which used engaging and fun educational materials and settings, to stimulate lessons on basic neuroscience and the biology of addiction. Additionally a detailed curriculum, "Brain Power: It's all in Your Head," was developed for middle school teachers and students. The curriculum contains engaging lessons on a variety of neuroscience topics, including drug abuse. This grant also organized 140 volunteer professionals who traveled to schools and community groups to give seminars on a variety of brain and drug abuse research topics. The speakers all included the importance of animals for biomedical research in their talks. Countless numbers of students and adults have been reached through this program. WABR also held Amazing Animal Research Student Contests in which students submitted essays and posters detailing the importance of animal research. Product Developed: a website offering interactive, free online games in which students assume authentic tasks and learn facts related to careers in science. Goal: In Cool Science Careers, adolescents can experience what it's like to be a scientist. The website currently offers interactive games related to epidemiology, neuropsychology, toxicology, neurobiology, and neuroradiology. For example, players analyze results of MRIs, perform an animal experiment, replicate a memory test, conduct a case-control study, and evaluate the results of GC/MS analysis. If students are unsure about which career to choose, they can take a career interest survey, which will match them with one of the careers on the website. The activities are accompanied by interviews with real scientists, information about educational requirements, and examples of related jobs, including those that do not require a M.D. 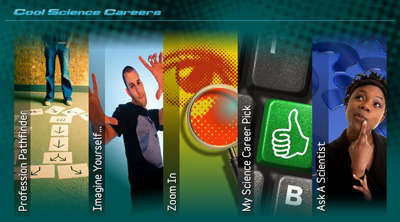 or Ph.D. Plus, students can find answers to common questions about careers in science and ask their own questions. Alignment with Standards: National Science Education Standards; Benchmarks for Science Literacy ; Technological Innovation and Learning Theory. Goal: This project was developed to train teachers and develop a unique approach for teaching minority middle school students about the science of drug abuse and addiction. The project developed new educational materials that adapted concepts from critical appraisal of the literature to translate research reports into forms that middle school students may evaluate. Using tools created by scientist-educator teams, students appraise plain language versions of research articles and compare them to accompanying media reports to ascertain accuracy of science reporting. Novice science teachers from minority school districts received training in the curriculum as well as in the neurobiology of drug abuse. Students who participate in the program learned more about science, math, health, and the methods used to conduct research. Goal: Two interactive online games were added to the highly successful CSI: Web Adventures: The Experience. These games were designed to teach about prescription drug abuse in the context of a crime scene investigation. In order to solve a case, players need to perform lab analyses (e.g., gas chromatography/mass spectrometry, ELISA, spectrophotometry) and conduct research about the nature and consequences of prescription drug abuse, including addiction, alteration of brain functions, and the risk of dying from an overdose. Alignment with Standards: National Science Education Standards; Benchmarks for Science Literacy; Healthy People 2010 and 2020; Technological Innovation and Learning Theory. Goal: This grant developed inquiry based curriculum materials about the science of drug addiction, including a multimedia component, a web component and print materials specific for each target audience. The combination of web, print and multimedia approaches provides a coherent program focused on major drug abuse related concepts. Print materials for parents and guardians have been translated into Spanish. This project produced outstanding materials similar to the Office of Science Education/NIDA project developed for high school, "The Brain: Understanding Neurobiology Through the Study of Addiction", also developed by Dr. Westbrook. Goal: This project sought to educate middle school students about the biology of drug abuse through the use of a problem-solving game in which the students carry out research in a simulated real-life situation. The game involves a multidisciplinary approach that is designed to make materials comprehensible to a diverse group of learners. Goal: This grant provided young Appalachian girls with an innovative multiyear program aimed at increasing their scientific knowledge and confidence to counter the under representation of rural girls who chose science and drug abuse research careers and to improve the knowledge of drug abuse research among rural girls. Girls in the program participated in Project Summer Institutes, Saturday Sessions, and scientific as well as community mentoring opportunities. The project also targeted middle school math and science teachers with professional development courses which focused on engaging girls in drug abuse research and science. In addition, the project included parental involvement through a series of workshops. This project also developed and disseminated a model curriculum to enhance teaching of science and drug abuse in rural areas, and a guide "Promoting Gender Equity in the Classroom" to enhance science education in rural areas. Goal: This program was developed to provide an inquiry-based educational program for use in the classroom that provides lessons on the neurobiology and behavioral effects of commonly abused drugs (e.g. alcohol, nicotine) and caffeine, as well as natural rewards such as table sugar. Planarians make an ideal subject for these lessons because they not only have a simple brain, but they also produce the same chemicals that contribute to addiction in humans. In addition, they are cheap, easy to use, and amenable to employing hands-on inquiry-based lesson plans that enable students to quantify actual human-like responses to drugs of abuse. These lessons allow students to simulate the roles of scientists by creating and testing their own hypotheses to study the science that underlies drug addiction. Goal: The Reconstructors series provides an entertaining, student -friendly means of educating adolescents about the biological and social impact of drugs of abuse. In each of the thematic games, players are presented with a problem to solve. Within the game, they gather scientific evidence, collect and interpret data, conduct laboratory experiments, and consult with experts. They learn how classes of drugs affect the body, especially the nervous system, leading players to understand the reasons for avoiding drugs of abuse. Each of thematic games consists of three to five consecutive episodes. In Uncommon Scents, students investigate a chemical accident and learn about the health effects of exposure to toxic chemicals. By learning about the accidental impact of toxic vapors, the player then discovers the serious consequences of intentional use of inhalants. In Nothing To Rave About, students are asked to uncover why there has been a dramatic increase in the number of teens admitted to the emergency room after partying at a local dance club. During their investigation, they learn how ecstasy and other club drugs act on the nervous system. In A Plaguing Problem, students “reconstruct” lost knowledge about pain relieving drugs such as opiates. They learn about concepts such as neurotransmission, the neurobiology and history underlying drug addiction, and pain management. Alignment with Standards: National Science Education Standards; Benchmarks for Science Literacy ; Healthy People 2010 and 2020; Technological Innovation and Learning Theory. Translation: Two of the games (Nothing to Rave About and A Plaguing Problem) have Spanish versions. Received an "A" review from Education World, an internet resource guide for educators. 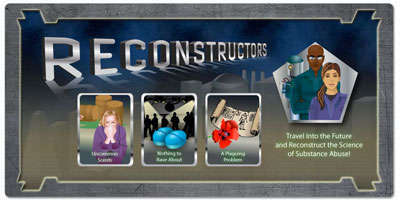 The Exploratorium named The Reconstructors one of their Ten Cool Sites for February 2001. Was named Hot Site of the Week at the Pacific Bell Knowledge Network. Received the Talking Hands Award for web sites appropriate for teaching hearing impaired children. The Science Teachers Association of Texas has recognized The Reconstructors Series as "Best of CAST 2003" (Conference for the Advancement of Science Teaching) in the July 2004 issue of the Texas Science Education Monthly. Was selected as a Digital Dozen site, which recognizes it as an exemplary web site for educators as chosen by the Eisenhower National Clearing (ENC). Was awarded the Ed-Media 2004 Outstanding Poster Award for "Using Web-based Multimedia Narrative and Simulations to Teach Drugs of Abuse." Web Page of the Month by Neuroscience for Kids Newsletter. An Online, Interactive Approach to Teaching Neuroscience to Adolescents, Miller, LM, et al., (2006) Cell Biology Education, Vol 5 p. 137-143. Using Web-Based Multimedia Narrative and Simulations to Teach about Drugs of Abuse, Miller, LM, et al., (2004) Conference Proceeding of ED-MEDIA 2004: World Conference on Educational Multimedia, Hypermedia, and Telecommunications, Lugano Switzerland, Vol 2004, Issue, 1, pp. 3959-3961. (Recipient of the Ed-Media 2004 Outstanding Poster Award). Using Narrative to Teach Neuroscience Concepts to Middle School Students Through a Web-Based Adventure Story, Miller, LM, et al., Proceeding of SITE 2002 Conference, Nashville Tennessee, March 18-23, 2002. Teaching Neuroscience Through Web Adventures: Adolescents Reconstruct the History and Science of Opioids, Miller, L.M., et al., (2002) The Neuroscientist1(8):16-21. Flash Forward to Problem-based Science, Miller, L.M., et al., (2002) Science Scope 25(3):154-157. Middle School Students and Technology: Habits and Preferences, Miller, L.M., (2001) TechEdge, Journal of Texas Association of Computer Educators 20(1):125-140. Middle School Students' Technology Practices and Preferences: Re-Examining Gender Differences. Journal of Educational Multimedia and Hypermedia, 10(2), 125-140, 2001. Product Developed: Minority middle and high school students and their teachers will receive training in how to conduct science fairs. Goal: This project used science fairs to improve science literacy and minority participation in science. To enable science teachers and adult mentors to get more students at middle and high school levels involved in science fairs, the project offered training in research methods, technical assistance regarding science fairs, and other resources to science teachers in grades 6-12 in New Jersey. Each summer teachers participated in a 5-week workshop to learn how to use research to study the effects of drugs and the nature of drug abuse and addiction. They also learned how to promote inquiry-based learning in their students and how to engage them in the process of doing science by producing interesting, novel projects for science fairs. Students had the opportunity to present their projects in elementary school, libraries, community centers, science expos, and at research luncheons. An on-line version is being developed. Contact: J. Bill Whitlow, Jr., Ph.D.
Goal: This project targeted teachers of English language learners in grades 7-12 to assist them in improving science achievement. English learners are students who report a primary language other than English and who have been determined to lack the clearly defined English language skills necessary to succeed in regular instruction programs. The number of English learners in the US has increased dramatically between 1970 (8.5% English Learners) and 2004 (18.5% English Learners). In California, 33% of children ages 5-17 speak Spanish as their primary language and another 8% speak languages other than English. This program targeted science teachers who lacked pedagogical strategies and materials that would assist them in teaching science to English learners. It used drug abuse and addiction as an interest approach to improve the ability of teachers to implement research-based strategies that enable English Learners to master science content. It did this through a summer training program followed by a year-long program for teachers in which they not only learned the science, but also developed lab-based lessons specifically targeted for English Learners. In addition, the teachers were partnered with researchers as they progressed through the program. This program provided culturally appropriate materials and pedagogical approaches for teaching English Learners who speak Spanish, Vietnamese, Hmong, Punjabi and Khmer. Contact: Adela de la Torre, Ph.D.
Goal: This program developed, implemented, evaluated, and disseminated a model inquiry-based neuroscience education program on the biological basis of drug abuse. It resulted in the implementation of in-depth, inquiry-based curriculum materials and teacher training programs, supported by an online mentoring network, which promotes enhanced understanding and application of neuroscience and the biology of drug abuse into the secondary science curriculum. The program was based on a previous project, BrainU (Brain Science on the Move) which was developed for 5-8th grade science teachers. This highly successful program was expanded and transitioned into a permanent formal training program for secondary science educators to provide accurate neuroscience and drug abuse information to teachers and their students. The project also conducted a study of the effectiveness and impact of very short vs long professional development experiences and the efficacy of web-based vs personal follow-up support. 2011 Distinguished Teaching Award in Postbaccalaureate, Professional and Graduate Education for the University of Minnesota – Awarded to Janet Dubinsky, Ph.D. for the development of BrainU funded through SEDAPA and SEPA grants. Goal: This project developed instructional materials, including a mixture of hands-on-tactile models of proteins and cells/synapses and interactive computer-based activities that complement and extend the learning from the hands-on activities for high school students. Several kits were developed: a Synapse Construction Kit, a Phospholipid and Membrane Transport Kit, and a Neuron Kit. A week-long professional development experience for teachers was held as part of the project during the summers of 2014, 2015, and 2016. The course provided not only information on the curriculum materials, but also background knowledge on neurobiology that was relevant to the courses taught by the teachers. Product Developed: a series of curriculum modules on drug abuse, including a set of learning objectives, an inquiry-directed student handout, a teacher's guide, a glossary, a resource list and student hands-on activities and assessment strategies. Goal: These materials are designed to help high school students integrate what they have learned in biology and chemistry using pharmacology, particularly the pharmacology of abused drug. They also include related subjects, such as public policy, psychology and social sciences. Availability: The materials are available in paper format. Integration of Pharmacology Topics in High School Biology and Chemistry Classes Improves Performance, Schwartz-Bloom R. & Halpin, M. (2003). Journal of Research in Science Teaching, 40, No. 9, 922-938. The Pharmacology Education Partnership: Improving high school biology and chemistry, Schwartz-Bloom & Halpin (2004). Proceedings of the Conference on K-12 Outreach from University Science Departments. Pharmacology Topics Help High School Students Learn Basic Principles of Biology and Chemistry, Halpin, MJ., et al. (2005) The Science Teacher 72:48-51. Teaching High School Chemistry in the Context of Pharmacology Helps Both Teachers and Students Learn. Schwartz-Bloom, et al., (2011) Journal of Chemical Education (in press). Goal: This grant developed a curriculum focused on teaching drug abuse within the context of epidemiology while engaging the high school students in complex questions. Teachers have recognized the value of epidemiology for empowering students to make more informed health decisions, increasing students' media literacy and their understanding of public health messages, increasing students' understanding of the basis for determining risk, improving students' mathematical and scientific literacy, and expanding students' understanding of scientific methods and developing their critical thinking skills. These coupled with the need to teach drug abuse education, opens the possibility for a new innovative curriculum that teaches drug abuse in a unique fashion. Availability: The curriculum is available on the web. Goal: This web site is designed for use in courses such as Biology or Anatomy and Physiology, with the goal of improving knowledge about genetics and its role in addiction. In developing these materials, Dr. Stark used a novel approach to web-based educational materials, Exploragraphic Web Design, a web program that optimally utilizes the Internet as a learning environment and provides multiple levels of information, facilitating differentiated learning. Goal: This project developed a comprehensive online Biology100-Biology of Addiction course for third and fourth year high school students that is taught at a college-level. The course teaches biology concepts that the students need to learn using drug addiction as the main topic. It incorporates state of the art technology and instructional practices by promoting school districts’ capacity for high quality online teaching and learning – an educational need that has been expressed by many school districts that want to align with young people’s interest in online environments. Teachers and students are connected with University of Washington faculty and current research in the neurobiology of addiction. The course is disseminated through the University of Washington in the High School program which for over 26 years has successfully brought college level courses to high schools throughout Washington State. Goal: This project developed a curriculum on the biology of drug abuse and addiction and a professional development training model for effectively disseminating the curriculum and promoting its adoption by teachers. The curriculum is problem-based with related instructional resources to model how research-based instructional strategies can be applied to teaching the biology of drug abuse and addiction. The curriculum includes biology topics that the students must learn incorporated into a drug abuse topic. It includes laboratory activities and computer-based resources that can easily be incorporated into a district’s existing high school science curriculum. The curriculum modules align with New York State’s Math, Science and Technology Learning Standards and with the National Science Education Standards. Goal: This project sought to increase science literacy of adolescents on the topic of tobacco use and nicotine, provide students with tools to resist the creative marketing of alternative tobacco products, and help students make appropriate decisions about (not) smoking or using other tobacco products that carry implied claims of being "safer" than regular cigarettes. A science education-based module on tobacco products and nicotine addiction was developed for use in hgh school health education classes. In addition professional development was provided to health education teachers to help them serve as learning facilitators of the science education module. Goal: This grant involved students in authentic research by having them sequence a portion of a gene involved in nicotine metabolism. In addition, teachers received one week of professional development to prepare them to lead students in learning about the biology of drug abuse and how DNA sequencing contributes to our understanding of it. Goal: To enhance the public's understanding of the neurobiology of drug abuse the museum exhibit, "Changing Your Mind: Drugs and the Brain" was developed in the early 1990's. It opened at the Boston Museum of Science November 29, 1994. Since then, it has traveled on a national tour before returning to the museum where it was on display for many years. The exhibit was visited by thousands of people across the nation and has had an immeasurable impact on the public's understanding of drug abuse and the brain. Goal: This grant developed ten yearly news stories on science topics about the brain and drug addiction for broadcast on local TV stations across America. It also developed in-depth Web materials to go with the news stores. The availability of broadcast-quality video-on-demand through the Internet is allowed Dr. Kutner to distribute neuroscience education materials not only to local television stations but also to news-oriented websites at no additional expense. This grant is also sought to improve the coverage of neuroscience by training journalists through online courses. The courses provided background information related to the news stories being produced through the grant. The journalists who took the courses had little or no scientific background since most science stories for local TV and radio stations and newspapers are covered by non-specialist reporters. The National Press Foundation was a partner in these efforts. Others - Journalists, Legislators, etc. Product Developed: The University of Washington School of Nursing, School of Medicine, Department of Pharmacology, College of Education, and Educational Outreach collaborated to produce a three quarter, nine credit distance learning certificate program, Addiction and the Brain. Goal: The program is designed to provide an interactive learning environment which prepares participants to apply the knowledge they gain about the neurobiology of addiction directly to their work environment. The online courses teach neuroscience concepts necessary to understand the brain's reward system; increase participants' knowledge of the neurobiological mechanism of addiction; and increase participants' ability to implement neuroscience-based resources and curricula about addiction in their areas of practice. Availability: The program has been institutionalized at the University of Washington School of Nursing and The University of Washington Education Outreach. Goal: These grants sought to educate journalists to attain the highest standards of scientific accuracy in reporting about drug abuse and to provide state legislators with the knowledge necessary to make well thought out decisions about substance abuse and its treatment. Goal: : This grant developed a three-hour science of addiction curriculum that can be infused into addiction counseling, criminal justice, nursing and social work courses and creating a study design that will examine the impact of curriculum infusion and instructor fidelity on student knowledge and attitude, and instructor and student satisfaction. Goal: This project constructed a unique state of the art internet-based education program on substance abuse for medical students in the US. Tutorials covering the neurobiology, pathogenesis, epidemiology, diagnosis, clinical course, psychology and treatment of substance abuse for each of the 4 years of medical school were constructed. Each tutorial utilizes text, tables, figures, animations, movies, a popup glossary and links for additional reading. A central feature of each tutorial is the use of interactive animations and questions that produce immediate feedback to the student regarding their performance.